At a time when the elections are less than a year away, political parties in Ludhiana are placed in a dilemma over the rising militant trade unionism that has been threatening the industrial growth of the city. The Economic Offences wing of the police will inquire into a land fraud case in which a physically challenged widow, Anu Jethi, of Ayali Khurd was allegedly duped of the rights to her property in the village by her nephew. 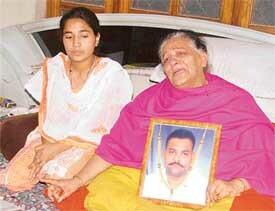 Anu Jethi, a physically challenged widow, narrates her tale of woe in Ludhiana. Even as the municipal corporation grapples with the problem of slums, more and more such colonies are mushrooming in the city. 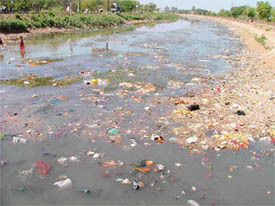 A number of slums have come up along the Sidhwan canal over the past few months. “The rally on March 20, being organised by the SAD at Samrala against ‘state repression’, will be historic,” said Jathedar Kirpal Singh Khirnia while addressing Akali workers at Gurdwara Sahib, Khamano. Peeved at the recent notification of the Punjab Government ordering the shooting of blue bulls to help the peasantry, the People for Animals has taken up the matter with the President of India stating that the shooting would render the shy animals extinct. Their dreams to get a job in the Ludhiana Municipal Corporation , as promised by the authorities some years ago, were shattered once again when they received a letter from the civic body authorities expressing their helplessness to help them in the matter. On behalf of the People for the Ethical Treatment of Animals, MP Maneka Gandhi has written to formula one driver, Fernando Alonso of Spain, urging him to stop mimicking the movements of a matador while standing on his car or at the podium. This was stated in a press note here today. The ex-service wing of the SAD has extended financial and moral support to the family of Harban Singh, an ex-serviceman of Rangoowal village who had died after suffering from infection that was caused after he was reportedly sexually assaulted by three persons. “The Capt Amarinder Singh government has fulfilled 95 per cent poll promises while the remaining will be fulfilled soon,” said Mr Amrik Singh Dhillon, MLA, Samrala, while distributing cheques to sarpanches of the area. The Parliamentary Secretary, Mr Surinder Dawar, laid the foundation stone of a senior citizens bhavan at Kidwai Nagar here today. 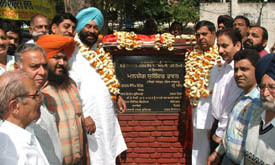 The Parliamentary Secretary, Mr Surinder Dawar, and the Mayor, Mr Nahar Singh Gill, inaugurate a senior citizens bhavan at Kidwai Nagar in Ludhiana on Saturday. — Photo by I.V. Hardial Singh of Hanskalan, who had allegedly usurped the property of her daughter-in-law, has been arrested under Sections 420, 467, 468 and 471 of the IPC and 12 of the Passport Act 1967. Two unidentified men allegedly robbed a costly mobile phone instrument from a Class XI student of Sargodha Public School near Gurdwara Dukhniwaran Sahib here today morning under mysterious circumstances. An accident on the Ghudani Kalan-Rara Sahib road resulted in the death of the motorcyclist and left his wife injured. According to information, deceased Sohan Singh was driving his motor cycle (No. PB-BN-6439), with his wife Gurmeet Kaur on the pillion. Punjab National Bank, which has over 400 branches across the country, has formed a Kisan Bhalai Trust to uplift farmers through farm-related business. This was stated by Mr Rattan Singh, Director, Farm Training Centre, Shamsher Nagar (Sirhind), here today. With a view to contributing towards the development of textile industry, the upcoming Fashion Technology Park, Mohali, signed agreements with the Knitwear Club, Shawl Club and Ludhiana Integrated Textile Park Ltd here late last evening. 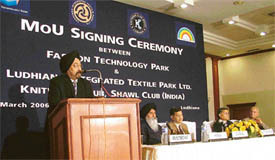 Mr Jagjit Singh Kochar, CEO of the Fashion Technology Park, Mohali, signs MoUs with textile units in Ludhiana on Saturday. — Photo by I.V. The Postgraduate Department of Commerce, Guru Nanak Khalsa College for Women, Gujarkhan Campus, Model Town, organised a farewell party today to bid adieu to the students of M.Com final year. 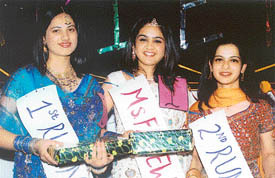 The winners of the Ms Freshers contest organised by Guru Nanak Khalsa College, Gujjar Khan campus; and (right) Mr D.S. 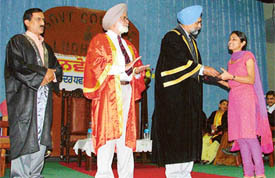 Bains, Secretary, Animal Husbandry, presents the college colours to a student at the convocation of SCD Government College in Ludhiana on Saturday. — Photos by I.V. Samita Munjal is a promising designer who has already held a number of exhibitions and has won critical acclaim. Recently she held a two-day exhibition of her latest creations. Her collection comprised Indian and western clothes. Hero DMC Heart Institute will organise a free heart checkup camp on the occasion of the opening of a new multispeciality hospital — G.K. Hospital — opposite Hero Cycles Ltd, tomorrow. The local building of the ESI Hospital, which was set up over a decade ago, has been waiting for inauguration. Mr Ramesh Chander Dogra, Health and Family Welfare Minister, Punjab, at the last meeting of the Regional Board of the ESI, Punjab, had given directions to the authorities concerned to make sure that the 50-bedded hospital become functional in February. vice-chairman of Baba Jaswant Singh Dental College Hospital and Research Institute, expressed these views while addressing the inaugural function of the annual sports meet of the institute here today.